Lovely set of 20 plain wooden 4cm wreaths, ready to paint, stain, glitter or just leave as they are. 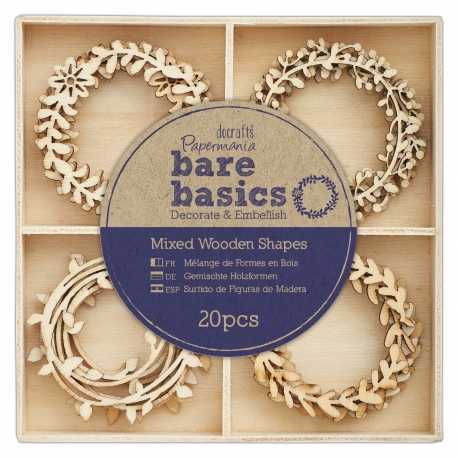 All are contained in a useful divided wooden tray that's great to reuse afterwards for beads, brads and small items. 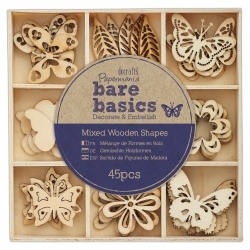 Lovely set of 45 plain wooden 2.5-3cm assorted butterflies and flowers, ready to paint, stain, glitter or just leave as they are. All are contained in a useful divided wooden tray that's great to reuse afterwards for beads, brads and small items. 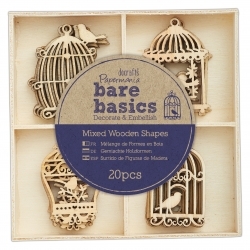 Lovely set of 20 plain wooden 4-4.5cm birdcages, ready to paint, stain, glitter or just leave as they are. All are contained in a useful divided wooden tray that's great to reuse afterwards for beads, brads and small items. 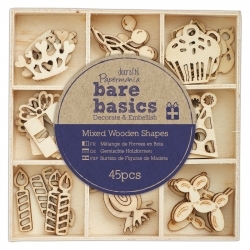 Lovely set of 45 plain wooden 2-3cm assorted birthday shapes, ready to paint, stain, glitter or just leave as they are. Includes balloons, candles, cupcakes, party hats, presents and more. All are contained in a useful divided wooden tray that's great to reuse afterwards for beads, brads and small items.